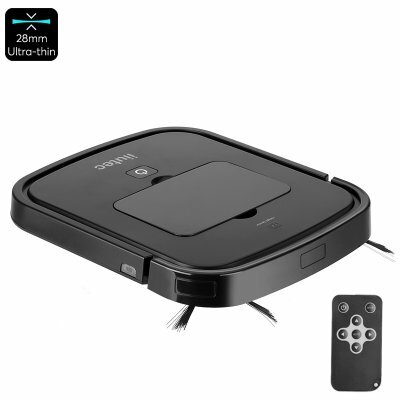 Successfully Added iiutec R-Cruiser Robotic Vacuum Cleaner - Ultra-Thin, 2000mAh, U-Path Cleaning, Shock Proof, 60dB Low Sound, 460Pa Suction to your Shopping Cart. The iiutec R-Cruiser is a smart robotic vacuum cleaner that is sure to keep your home clean and tidy at all times. With its ultra-slim body that measures merely 2.95CM in height, this robot vacuum cleaner is capable of cleaning the tightest of places. It furthermore supports different working modes that allow this smart home accessory to work efficiently on almost all surfaces imaginable. Whether it is a wooden floor or tiles, the iiutec R-Cruiser vacuum cleaner is sure to do its job. From now on, you can be guaranteed that your floors will always be clean and shine bright without you needing to put in any effort. Packing a 2000mAh battery, this robotic vacuum cleaner is capable of cleaning your property for up to 90 minutes in a row. Thanks to its USB port, your robot cleaner can be easily recharged once it has run out of juice. By supporting a U-path cleaning system, this robotic vacuum cleaner is guaranteed to hit even the most remote corners of your property. Therefore, you can be assured that not a single piece of dirt or dust stays around when the iiutec R-Cruiser is doing its job. With its durable body that is both shock and fall proof, you will be able to use this robotic vacuum cleaner safely around pets and children. The high-speed spinning blades of this robotic vacuum cleaner will efficiently collect all dust and dirt on its path. With 460pa of suction, you can be guaranteed that your smart home accessory does not leave anything behind. It furthermore comes with a low-noise design. When in use, it produces merely 60dB of sound. Therefore, your robotic vacuum cleaner can clean your apartment without distracting you while watching a movie or doing your homework. It furthermore comes with an abundance of feature that let your vacuum cleaner maneuver through your room without bumping into any furniture. Thanks to this robot vacuum cleaner, you’ll never have to worry about cleaning your home again. From now on, your floors will be tidy without you needing to spend the slightest amount of effort.